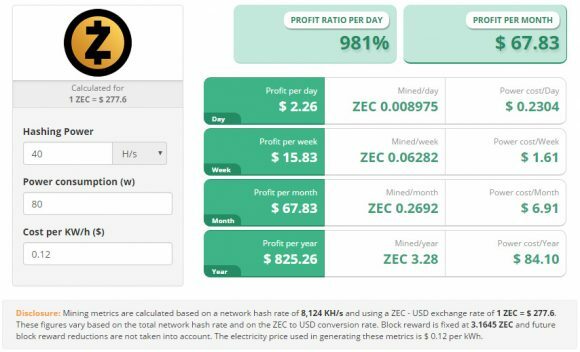 After the initial craze due to the scarcity of Zcash (ZEC) coins and the big demand the prices has skyrocketed, but now with the slow start of mining progressing and the total block reward almost at 4 ZEC things are starting to stabilize. The initial crazy high profit for mining and selling Zcash coins seems to be over and at the moment mining and selling ETH or ZEC does bring almost the same profit for some GPU miners, though not for all. Miners with older AMD Radeon 79×0 and 280X GPUs still have higher profit mining Zcash than Ethereum, but for users with RX 480 for example things are already on the line to switch back to Ethereum. Nvidia seems to be currently lagging as far as performance optimizations for Zcash go, so the profitability there could be better for another algorithm or mining for another perspective in the long term crypto coin might also be a viable option. You can keep track of the current profitability with the help of some useful mining calculators like the ones provided by CryptoCompare for both Zcash (ZEC) as well as for Ethereum (ETH) along with a few other popular coins such as Ethereum Classic (ETC), Monero (XMR), DigitalCash (DASH) and Litecoin (LTC). Make sure you set the correct hashrate your mining hardware is providing for each algorithm to make a proper calculation as different GPUs do provide different hashrate for the various algorithms. Do note that Etheeum Classic might also turn out to be pretty profitable alternative as well for some video cards that are still providing higher hashrate for the Ethash algorithm.